The Den-Con MP Multipurpose Safety Clamp is a safe and convenient tool to prevent dropping slick drill collars or flush joint pipe into the hole while making up or breaking out the string. Other popular uses include use when running large diameter surface casing, handling of drilling risers and casing heads during installation and lifting prepacked gravel liners. The multi-link design provides uniform pressure around the pipe so the risks of crushing the pipe or damaging the surface are minimized. Each link, complete with tapered slip, is interchangeable as a unit and is readily adaptable to any diameter from 2 7/8” to 39 1/2”. 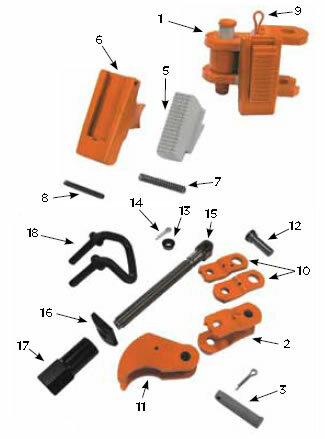 All Den-Con MP series parts interchange with Varco MPS and larger clamp parts. Not to be used as a hoisting device unless fitted with lifting eyes. SIZE & TYPE # LINKS # DIES VARCO PART # WT. LBS. ITEM # DCT # DESCRIPTION VARCO PART # QTY. REQD.